View More In Oil Sprayers & Dispensers. Finally: the solution you have been searching for. Our chefs, cooks, weekend barbecue warriors tell us they love it and you will too. 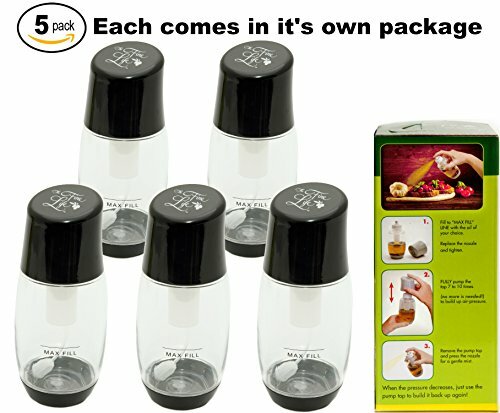 Get yourself 1, 2, 3 for your kitchen, RV, Boat now. HEALTH & LIFE ENHANCING - Using an Air Fryer? On a Paleo Diet, use HCG or just love flavor? Get just the oil you want. FDA-APPROVED BPA-FREE - air pressure system eliminates smelly chemical propellants from your food. "SO GLAD IT'S NOT GLASS!" - safe on any surface - perfect for patio, boat, or RV food preparation. REFILL & REUSE - with ALL your favorite oils - such a Fine Mist no more wasted oil down your drain! If you have any questions about this product by The Fine Life, contact us by completing and submitting the form below. If you are looking for a specif part number, please include it with your message.